position The position of the handle in the space of Handles.matrix. rotation The rotation of the handle in the space of Handles.matrix. size The size of the handle in the space of Handles.matrix. Use HandleUtility.GetHandleSize if you want a constant screen-space size. snap The snap increment on all axes. See Handles.SnapValue. capFunction The function to call for doing the actual drawing. controlID The control ID for the handle. Vector3 The new value modified by the user's interaction with the handle. If the user has not moved the handle, it will return the same value as you passed into the function. Make an unconstrained movement handle. This handle can move freely in all directions. 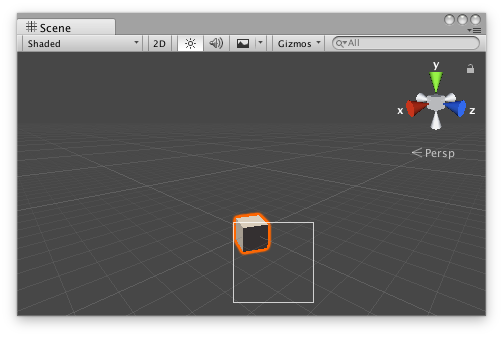 Hold down Ctrl (Cmd on macOS) to snap to the grid (see PositioningGameObjects). Hold Ctrl-Shift (Cmd-Shift on macOS) to snap the object to any Collider surface under the mouse pointer. Free Move handle in the Scene View. Add the following script to your Assets folder as FreeMoveHandleExample.cs and add the FreeMoveHandleExample component to an object in a Scene. Add the following script to Assets/Editor as FreeMoveHandleExampleEditor.cs and select the object with the FreeMoveHandleExample component.